While Doug was engaged in the trappings of business, Ian and I took off for a late morning shakedown to the tip of the Mull of Kintyre. 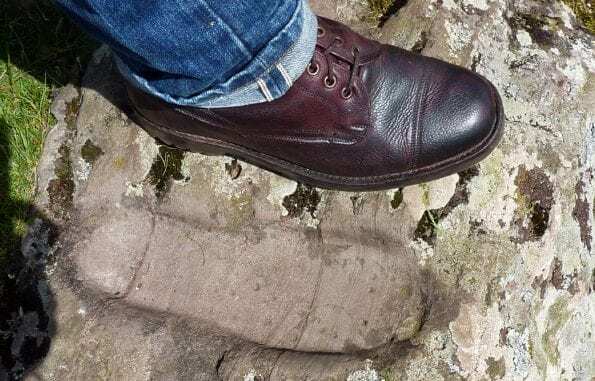 Ian was keen to show me St Columba’s footsteps – a set of commemorative foot carvings located at Southend. Our itinerary would also include a visit to Southend’s abandoned art deco Hotel. It was another extremely hot ride and on the way I began to fancy that my Enfield was wheezing up some of the longer inclines. I had serviced the bike before departing but recalled that on my previous Ullapool trip the Bullet had developed an unhealthy appetite for oil. Neither of us had noticed any abnormal smoking from my Enfield’s exhaust but when we checked the engine oil level, sure enough, it was sitting on the low mark. I made a mental note to top up on our return to Campbeltown. Later we met up with Doug and Gregor and the afternoon plan was a trip around the back of Kintyre on the B842. 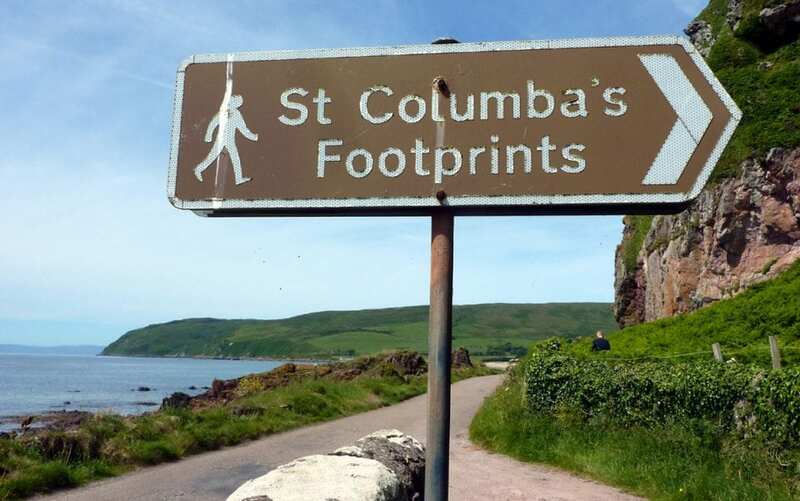 The route would include the scenic beaches of Carradale Bay and a late lunch at the ideally placed Skipness seafood restaurant before a short hop to Tarbet. 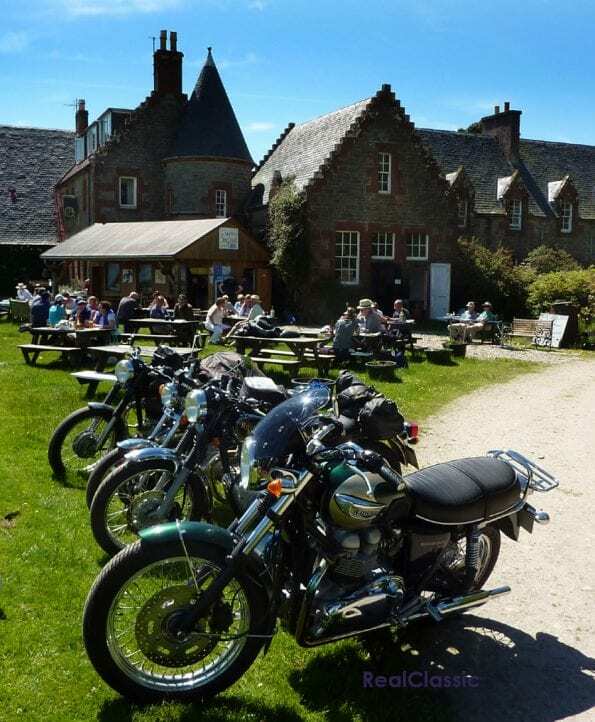 The idea was given a unanimous ‘aye!’ I topped up my Enfield with new oil before Doug and I decided to swap bikes for the afternoon jaunt. 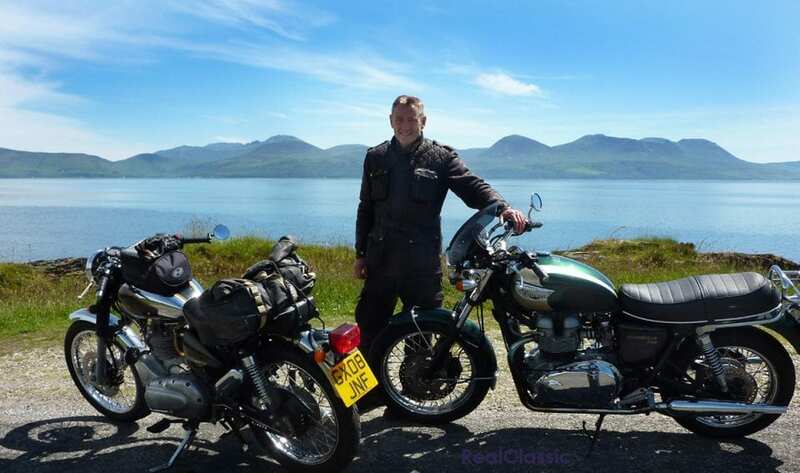 The modern Triumph Bonneville is familiar to me as I’ve been fortunate to own several in the past and I was looking forward to being reacquainted with what many consider to be Hinckley’s best. The B842 is a road that doesn’t seem to know where it’s going, with barely enough room for oncoming vehicles to pass a motorcycle. Some of the thrilling downhill Z-bends would be a hit at Alton Towers and Gregor coped admirably on his dinky little Suzuki DR125, hurtling it headlong down some of the gravel-strewn descents. It was a fun and thrilling ride. However, it wasn’t long before I began to tire of the Triumph’s hard seat and rearset footrests. The handlebars also began to pressure my palms, causing tingling in my fingertips. 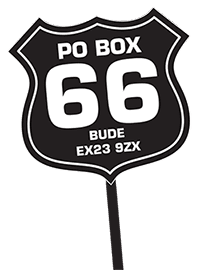 I became desperate for some faster sections so that the oncoming wind would raise my flagging torso from the bars, but the road kept winding on, and the oppressive heat added to my discomfort. 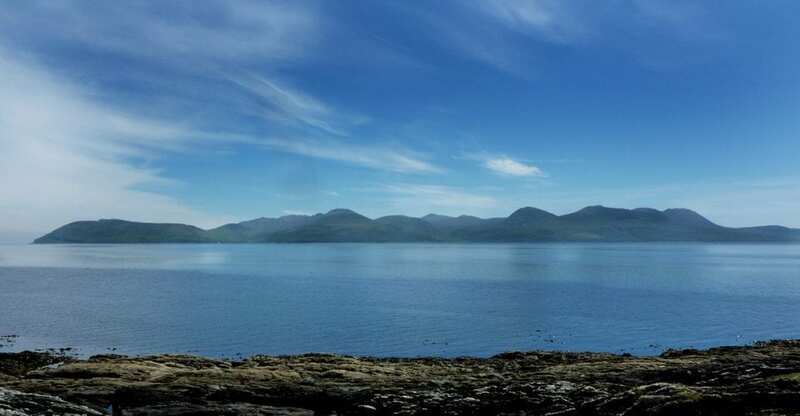 Despite the distraction of the island of Arran rising majestically above the sparkling blue sea, I began to suffer cramp in my hips, so I forced a stop and used the opportunity to snap some pictures of the island so beautifully set within its big blue backdrop. Onwards, and the road to Skipness was beginning to open up and afford some excellent sea views. 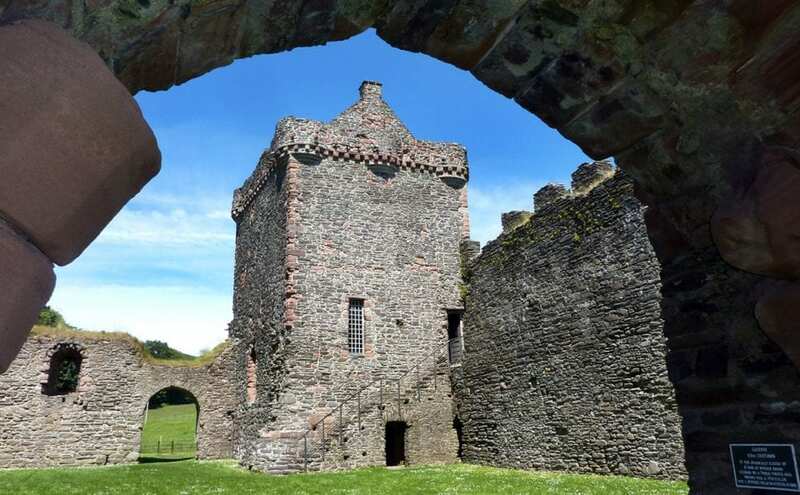 Before a seafood lunch at Skipness’ restaurant I wandered over to an ancient castle where I was startled by a resident red deer hind. I guessed the deer was used to wandering tourists, as it didn’t appear concerned with my presence and nonchalantly continued to graze without so much as a glance in my direction. Lunch was an expensive smoked salmon salad and we all bemoaned the meagre portions and absence of bread – available as an ‘extra’. I wasn’t overly impressed and began to fancy that I should have instead enjoyed a good graze alongside the deer in the more exotic surroundings of the castle. Over lunch the Glasgow boys debated a return journey home via the ferry to Portavadie. I didn’t really fancy a repeat trip of the previous day’s ride, preferring instead to visit some of my old haunts on the main A83 through Ardrishaig, Lochgilphead and Inveraray. So we decided to go our separate ways at Tarbet. 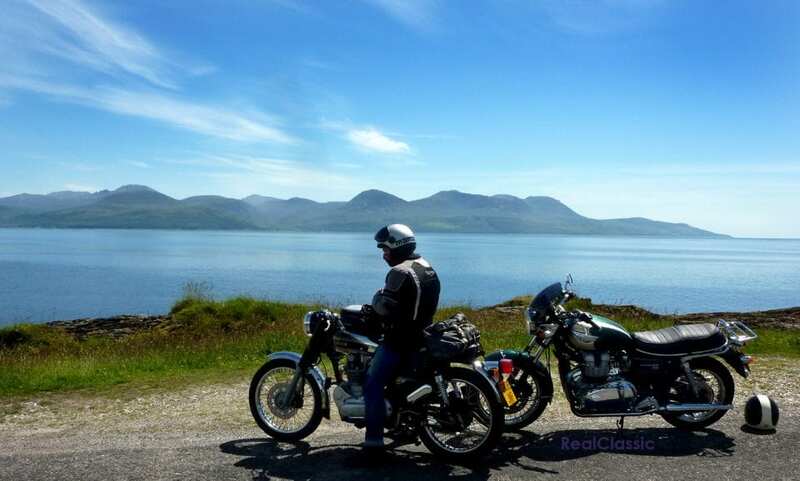 This turned out to be the right decision for me, as the scenery and weather was perfect as I plodded, back on the Enfield, like an accidental tourist through Loch Fyne’s finest seaside towns. 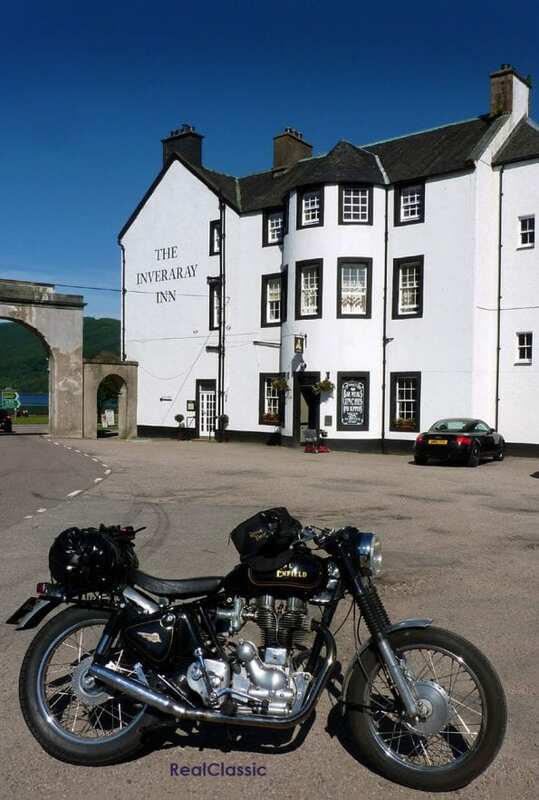 I stopped for fuel and a snack at the Inveraray Inn; much changed since I last stayed there in the mid-1970s. My planned route would now take me through Glen Aray and northwards though Glen Lochy to Tyndrum and Crianlarich and yet more gob-smacking scenery. The Glens north of Inveraray offer some spectacular mountain terrain but unfortunately the Enfield’s power loss returned and began to distract me up some of the steeper climbs. Predictably, the engine pulled with ease through the flat sections, but I began to worry that I was a long way from rescue. Following a short photo stop at Kilchurn Castle on the shores of Loch Awe, the Enfield refused to tick over, then proved difficult to start. 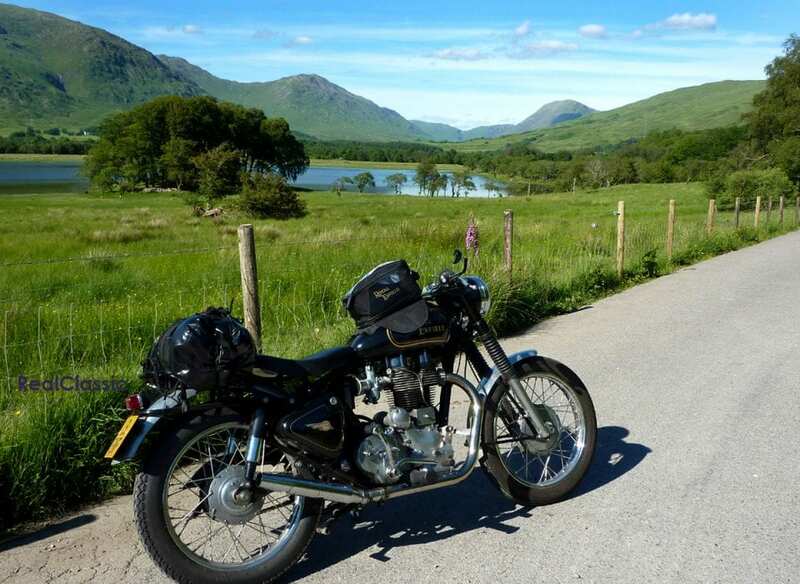 I managed to bump-start the bike, and passing through Tyndrum, Crainlarich and on down the long descent to Lochearnhead, the Enfield again ran flawlessly. Suspecting grit in the fuel I stopped and removed the float bowl’s drain plug and main jet, but all proved spotless. This time the bike started first kick. Now that I was back in familiar territory I began to relax and my thoughts turned to the possibility of a sticking valve lifter. More in hope I depressed the lifter at any opportunity, but every incline caused the Enfield to run out of puff and I was now compensating by dropping a gear up familiar hills – inclines that the Enfield would normally take in its stride. 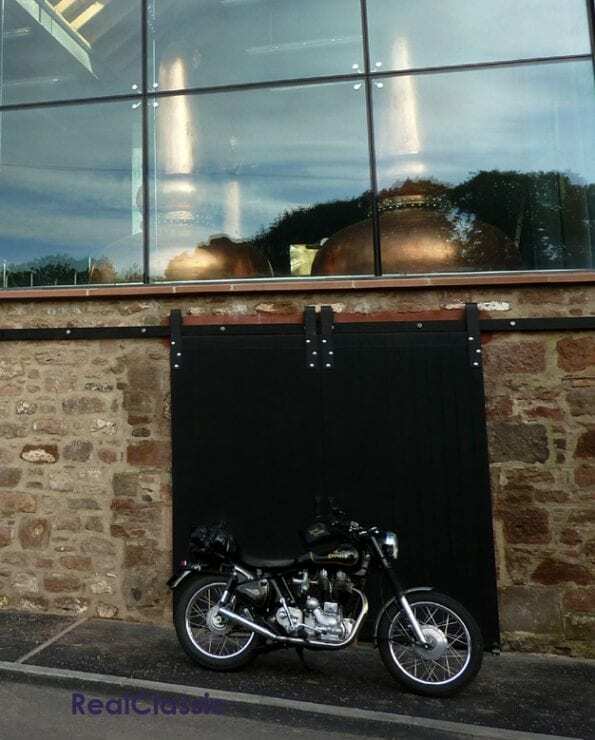 My last stop was at Newburgh for a picture of the newly-constructed Lindores Abbey Distillery before I enjoyed a nice sunny evening romp along the Tay estuary and home. What a journey! But I was so relieved to be back at home. I was kicking myself the following day when I discovering the Enfield’s wheezing was possibly caused by a tight exhaust tappet – an easy fix I thought – especially if I had carried a set of tappet spanners in my tool kit (note to self). However once the tappet was reset, the engine struggled to tick over sweetly, and there was still a perceptible loss of compression. The complete absence of any kicking back and the ability to kick the engine over without resorting to the valve-lifter was a real concern. So logically I removed the valve lifter and fitted a blanking plug, but this made no difference. Next I removed the cylinder head and poured in enough petrol to fill the up-turned combustion chamber. Immediately fuel began dripping from the exhaust port and I knew that the best scenario was a straightforward regrind of the exhaust valve. But with the valve removed and following several regrinds I was still unhappy with the condition of the valve face and its corresponding seat. With the valve back in its guide there was also some noticeable side play when compared to the inlet valve. So I ordered up a new guide and valve and delivered the parts and the cylinder head to Engine Resource of Dundee to let the experts cut and match the new valve to its seat. ‘Best doing a job once’ as the maxim decrees. A future test run would prove me right. In all we covered 347 cracking miles. Until next time!